Community Centre: The Sabal Harbour sub division recreational centre is located near the entrance to Sabal Harbour and is a 3 minute walk away from the villa. It features a large attractive swimming pool surrounded by a large patio with many loungers, as well as swings, slides and a climbing frame for the little ones. There are 2 tennis courts, a basketball court and a grassed recreational playing field. Shopping & Activities: Sarsota is famous for its smart and sophisticated shopping experience as well as many top class restaurants. For bargains visit the Ellenton Prime Outlets Mall which is only 15 min away. Plan on spending at least half a day there. The Pittsburgh Pirates baseball training camp is 5 min drive away, catch a game there in the pre-season. Tampa Bay Lightning in Tampa compete in the NHL hockey league during the winter and spring months. Enjoy many of the local watersports which are readily available including deep sea fishing, paragliding, jet skis, water skiing or charter a boat. The villa is within a 5-10 min car ride of a variety of strip and shopping malls, that include most of the major US recognised stores and the most popular and choice restaurants and pubs. Beaches: The most wonderful beaches are found nearby on the gulf coast: St. Pete's, Clearwater, Anna Maria Island, Siesta Key and Longboat Key are a relatively short distance away. Watch the dolphins or manatees from the beaches or experience dining at the beach side restaurants for local fresh fish catches and viewing the superb sunsets. St; John's Pass north of St. Petersburg gives you the old world feel. The Fishing Piers on the Sunshine Bridge offer a different experience and provide an excellent opportunity to snag one's own 'catch of the day'. We are snowbirds from Canada. Being brought up in the UK we find the cold winters in Canada too harsh so we look forward to visiting for an extended stay in the winter. We purchased this property so we could enjoy the pleasant winters in Florida. We enjoy the beaches, restaurants and shopping and find the villa accessible to all Florida has to offer. This is particularly important now as we have grandkids who like the Disney World, Busch Gardens etc. Because we live here for up to 6 months of the year our house is more like a home than a rental property, the kitchen is well equipped and the standard of the property is higher. There are 2 bathrooms, one en-suite and one family bathroom. The master bathroom has a large shower unit with seats at either end. As with all Florida houses. A/C minimum is 74F otherwise system may ice up and not work. The pool area is fully enclosed, the pool has a roll away blanket and there is a security fence which can be fully removed if children are not present. There is a gas BBQ and also a large table with chairs for outdoors dining. In addition there are four white loungers. Kitchen facilities include a coffee maker, blender, toaster, ice maker (in freezer) and waste disposal. An iron and ironing board are provided. In the garage there are a collection of beach chairs, umbrellas and noodles and other beach toys. All utilities are included as well as end of the stay clean. Phone calls are free within North America and a cordless phone is provided. Fantastic Florida! !.....When can we go back?? We had such a fantastic time staying at Judy's villa that we didn't want our holiday to end. The villa is exactly as the photos show and was very comfortable, well furnished and well equipped. We used the BBQ several times and it was also great to have access to cool boxes and beach chairs etc for trips to the beach. 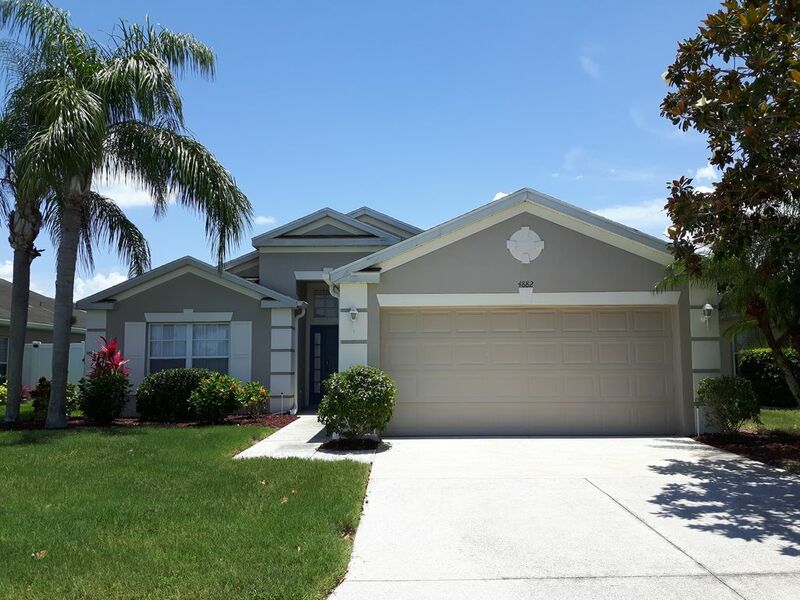 The villa is in a peaceful neighbourhood with many supermarkets and restaurants nearby, although, as with most Florida holidays, a car is essential. The location was perfect and we had easy access to Bradenton, Sarasota, many beaches and shopping malls. We particularly loved spending time at Anna Maria Island where we saw dolphins, Siesta Key and St Armands Circle. We also enjoyed browsing the shops at Ellenton Outlet and University Town Centre Malls. We visited Bradenton Riverwalk, Myakka State Park, Mixon fruit farms and watched Tampa Bay Lightening play ice hockey. The owner, Judy, was very helpful and quick to answer any of our questions before we travelled. Our security deposit was also returned very promptly. We had a fantastic holiday and would have no hesitation in returning to this villa in the future. Thank you to Judy for sharing your wonderful villa. I highly recommend this vacation rental! The house is really beautiful, well maintained, clean and in a nice neighborhood. I also really liked the location. Yes, this isn't on the beach but it is THE perfect location to get anywhere, including the beach. Heading to Tampa, you are near I75. Heading to the beach, just drive down highway 44. To St. Petes, take 44 to 301 and head north. All of these roads are right near the house. The pool is also really nice to relax and includes a nice view of the lake in the back yard with lots of big birds to watch (Geese, ducks, Storks, Ibis, Egret etc.). The owner is very friendly and communicative to answer any queries. Anyway, the next time I am in Tampa, I will definitely stay here again. Thank you so much Kurt for the great review. You were a great guest and are welcome any time..
We have been to Florida 3 times and found this villa to be the nicest one we have stayed in yet.. It was like a home from home.. The kitchen was very well equipped and the villa was in excellent condition. Everything was clean, there were plenty of towels, pillows etc. The pool was amazing. It was a lovely size and very clean. We are a family of 7 (2 adults and 5 children) and we found this villa and pool to give us all a lot of space. Bradenton is conveniently located to visit Clearwater, Sarasota and St Petersburg. We dealt with Judy who is the homeowner and we found her to be very helpful and always answering any questions we had. We were very, very impressed with this villa and we will definitely visit again in the future. We have been renting this house for the past nine years. It has all the amenities one would want in a vacation home. We feel very much at home in this great neighborhood. So conveniently located to all major stores, beaches, restaurants. This is our third year in a row staying in Judy's villa and every year it gets better and better. It is my haven - I will never tire of sitting outside at all hours of the day and enjoying the tranquility (and watching the amazing lightning storms in August, at night, across the lake). My brother-in-law rents out houses in Florida and is always amazed when he visits us, at how well-equipped our home from home is. The new barbecue this year was very easy to use, meaning eating in was as easy as eating out and the beds are unbelievably comfortable (as I can never normally sleep well anywhere away from home, yet sleep like a baby here!) The whole experience is well organised, the neighbours are lovely and even the management company representative is British! We have already started booking for next year and can't wait to go back to what is becoming my second home. Thanks again, Judy. house is extremely clean and 25 min drives to siesta beach and lido beach as well. Kids love the pool. Our villa which overlooks a lake and nature reserve, is located in a quiet residential community which possesses tennis courts, basketball courts, recreational playing field, children's playground with swings, climbing frames, slides and a large attractive pool with a shallow children's area . It is close to a variety of golf courses and is 25 min away from the most beautiful beaches, Anna Maria Island and Siesta Key. Here water sports are plentiful and include parasailing, jet ski rental, kayaking and motor boat hire. It is 15 min from the Prime Outlet Designer Mall in Ellenton and 20 min from St. Armands Circle in Sarasota. It is within minutes from Walmart, Bealls, Publix etc. and local restaurants, Applebees, MacDonalds, Pizza Hut, Outback etc. Busch Gardens in Tampa is just a 50 min drive away and Disneyland in Orlando is 90 minutes. The South Florida Museum where you can learn about and get close to the Manatees is a short drive away. Golf: Located adjacent to Peridia Golf & Country Club and only 2.5 km from Ted McAnlies' 72 par championship course at the Preserve Golf Club at Tara There are plenty of reasonably priced golf courses in the area within a relatively short drive. Favourites are Buffalo Creek, The Links and University. Winter seasonal rates are much higher than mid summer rates. Rates include departure cleaning. Rates for Easter week and Christmas and the New Year are at premium rates.